The viewing platform at the world-famous Twelve Apostles site offers exceptional views out across this ancient rock formation, where the jutting shapes carve interesting silhouettes against the setting sun. At just a five-minute walk from the car park, the viewing platform is the ideal place to catch sunrise or sunset. While the location is open all year round, the best time to shoot here is in the late spring through to the early autumn when the weather is warm. The Apostles are best viewed at sunrise and sunset. However, on a day with a lot of cloud activity, you can probably pull off some good shots through till the late morning. This image belongs to the travel and nature stock photo library. This stock photo of Vivid Sunset at The Twelve Apostles is available for licensing for commercial and editorial uses including websites, blogs, books, magazines, brochures and advertising. Restrictions may apply for images which contain third party copyrighted material or sensitive subjects. Photos of artwork are for editorial use only. 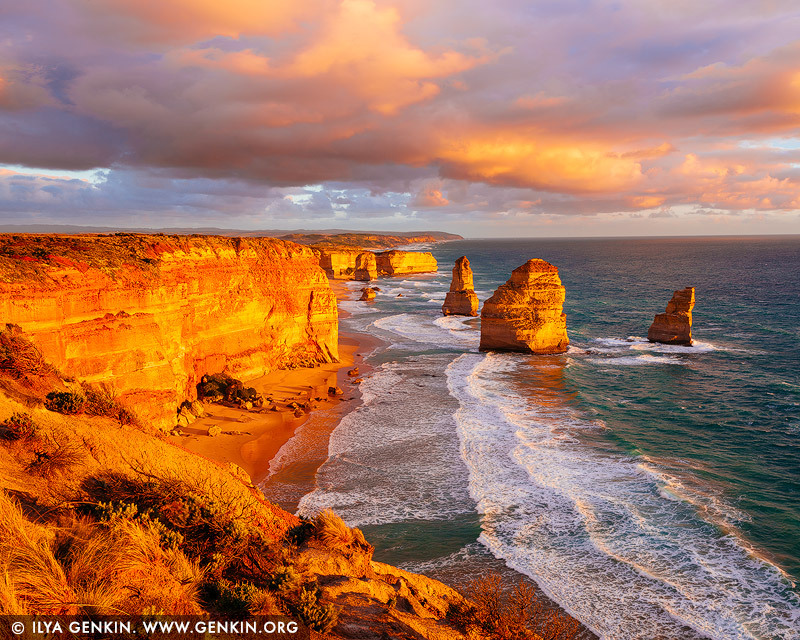 This image id APOST-0035 of Vivid Sunset at The Twelve Apostles, is copyrighted © by Ilya Genkin. This is not a public domain image.